Geomagic Control X is a comprehensive metrology software platform that delivers the industry’s most powerful tools within straightforward workflows. With Geomagic Control X quality managers are enabled with revolutionary ease-of-use, intuitive, comprehensive controls and traceable, repeatable workflows for the quality measurement process. Its fast, precise, information-rich reporting and analysis enable significant productivity and quality gains in any manufacturing workflow. 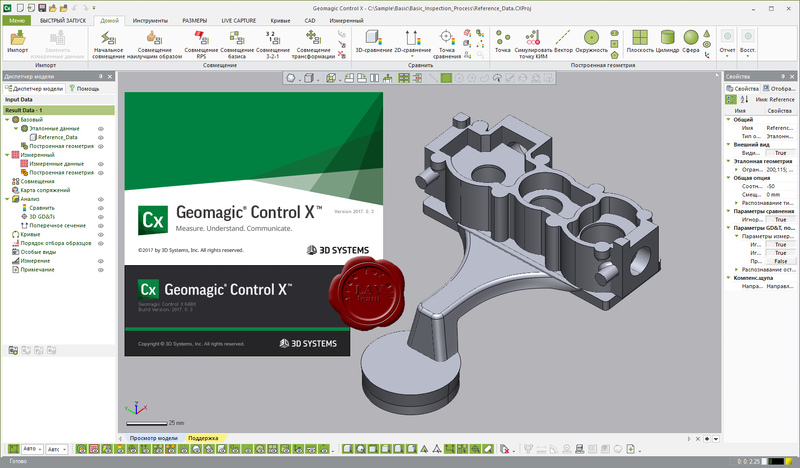 With a new User Interface, innovative new metrology and inspection tools, workflow-driven, preplanned processes and casual walk-up inspection, and more, Geomagic Control X delivers an unparalleled ease-of-use and comprehension for 3D inspection in any manufacturing workflow. Now accurate measurement and fast analysis of manufactured parts and assemblies is on-hand for anyone looking to significantly build quality in manufactured parts and assemblies. Have the freedom to measure in any order or style you desire, while the powerful Synchronous Inspection system captures the data hierarchy and automation in the background for repeatable and editable processes. Enjoy the power of Geomagic Control X where you spend more time focusing on getting the results, not time worrying about how to make the software work for you. Quickly conduct First Article inspections using the CAD-based dimensioning tools and have communication-ready information instantly at your fingertips. Native CAD importers including those which contain model-based GD&T definition are delivered standard at no additional cost.